We asked Hallmark writers to share their favorite Christmas movies and stories—the ones their families make a point of sitting down and watching or reading together. We certainly got an interesting mix—from the popular to the obscure to the unexpected. 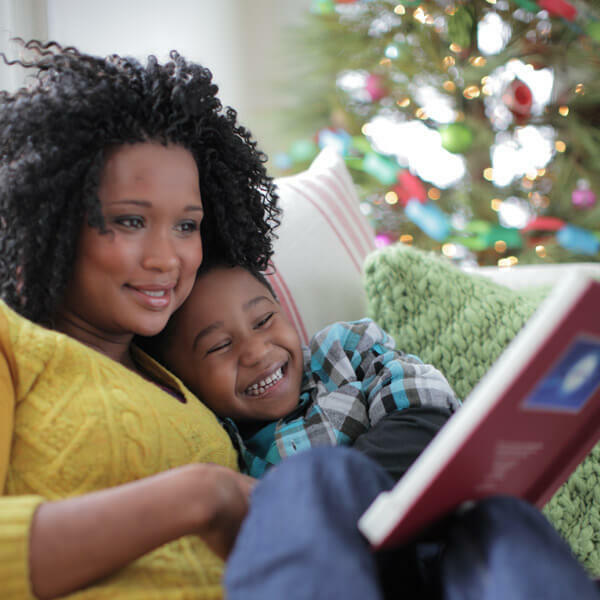 We hope this list inspires you and your family to check out some of these books and movies for your own holiday together-time. Fun and humor are really important to my family all year round. We don’t see Christmas as an exception and have a couple of favorites we watch together every year. One is Will Ferrell’s Elf because: Will Ferrell. And because it’s wildly sweet. The other is Stephen Colbert’s A Colbert Christmas: The Greatest Gift of All! We love its irreverence and its subversive sweetness. For us, it’s National Lampoon’s Christmas Vacation. Lines like, “Mmmm…looks great! Little full, lotta sap” and “Fixed the newel post” are part of our year-round family vernacular—code for those edge-of-­sanity, Sparky moments we all face from time to time. And, hey, after all, who doesn’t love ’em some Sparky? I know for a fact that we do. When I was a kid, we had to watch all the TV Christmas specials, but what was most meaningful to me was reading The Littlest Angel by Charles Tazewell. There’s something very poignant to a child hearing about another child who had died and gone to heaven and missed all the wonderful things about our world. It was heartbreaking and I cried. Not sure now why I “enjoyed” that. I remember seeing the Hallmark Hall of Fame production of it and probably sobbed through the whole thing. My husband and I have read Jotham’s Journey: A Storybook for Advent by Arnold Ytreeide with our daughters twice as a family Advent activity at Christmastime. The exciting story follows a lost boy named Jotham in the days leading up to the birth of Jesus. For us, reading it together day by day has been a great way to keep our focus on what the season is really all about. Our movie is Rudolph’s Shiny New Year, the ridiculous sequel to the claymation classic Rudolph, the Red-Nosed Reindeer. As a kid, I was spooked by the villain—a giant vulture named Eon the Terrible. I would watch the parts with him in it from behind my grandparents’ rocking chair. Now, a couple decades later, the movie plays two to three times during the holidays on TV, and my family makes it a priority to watch it together and point out good places around the house for me to hide behind when the vulture appears. Gotta love family. Our family favorite holiday movie is One Magic Christmas, which is It’s a Wonderful Life in a 1980s style. A discouraged mom (Mary Steenburgen) with a goodhearted but out-of-work husband really hates Christmas until an angel (Harry Dean Stanton) magically intervenes. It’s a charming combination of real life and fantasy, and it will make you quit being negative and start appreciating the people you love. Also, Harry Dean Stanton. As an angel. Is this Christmas or The Twilight Zone? In my house, it’s always a little of both each year. In “The Night of the Meek,” Henry Corwin is one bad Santa, but his drunken stumble into an opportunity to make everyone’s Christmas wishes come true creates a compelling and uplifting holiday installment of the classic anthology series. Whether you watch the 1960 original starring Art Carney or the 1985 remake with Richard Mulligan, Rod Serling’s take on the magic of Christmas never fails to entertain. Our favorite movie as kids was Will Vinton’s A Claymation Christmas Celebration. It was an instant hit with my sisters and I when it first aired on TV in 1987; we played it back on a VHS tape every year, quoting our favorite lines and pausing it at funny moments. To this day, these lines are some of our best inside jokes. It’s a perfect blend of amazing Claymation, humorous storytelling and focus on the meaning of popular Christmas carols. I knew I had to continue the tradition with my own little family, so I scoured the Internet to find a DVD version. (The VHS had seen better days!) It’s a special tradition to watch it every year, not only with my immediate and extended family, but now also with a close group of friends who have caught the tradition. We love putting out Robert Sabuda’s The 12 Days of Christmas: A Pop-up Celebration for the pleasure of reading and the amazing design work. With me being a writer and my partner being an artist, it’s the perfect holiday book for our son—who is talented in both! As a kid, I loved this scratch-and-sniff picture book called The Sweet Smell of Christmas by Patricia M. Scarry and J.P. Miller. It’s a story about a little bear getting ready for Christmas. My daughters have enjoyed it, too. Also, just like me, they’ve scratched the scratch-and-sniff pages so much, and so energetically, that they’ve worn holes in the pages of their copy. We didn’t really have a favorite movie for the whole family, which is kind of strange now that I think about it. But there was a book that got a LOT of attention all through our childhood: the Little Golden Book Santa’s Toy Shop. There was always something so endlessly charming and enlightening about the idea that a tired Santa might actually like to play with a few of the toys he’s spent so much time and energy making and delivering. Those beautiful illustrations of him on the floor in a child’s house, playing with a train and a plane—whenever I went to sleep at night on Christmas Eve, that’s the picture I always had in my head. And now, as a parent, when I read it to my own children, we always have to stop when we get to the part where Santa sits down to have “a bite of lunch.” You can see the wheels turning in their heads: “A cookie counts as lunch?” Somehow that’s just as amazing to them as Santa making house calls. Our family favorite is definitely the movie A Christmas Story. One year, I asked my son what he wanted to do for Christmas Eve. He replied, “What we always do! Watch A Christmas Story and eat pizza.” I hadn’t realized that for him, it had quickly become a tradition. (So glad I asked him!) Years later, when we made the decision to drop cable, I had to get my hands on a DVD of the movie before I could make the call to cancel the service or I would have been momma non grata. Our family loves to watch the 2006 film The Nativity Story at Christmas every year. It’s meaningful to us as a beautiful rendering of the biblical Christmas story, with great acting and enough gritty realism to give viewers a sense of the hardships that Joseph and Mary had to go through. We’re shown the bond that developed between them as they pondered the part they were playing in something as miraculous as Jesus’ birth. I have a few favorite movies: Fitzwilly and It Happened on Fifth Avenue. But I’m still working on getting my family and husband hooked on them like I am. I think that finding a few good (but perhaps not stellar) Christmas movies that not many people know about makes it seem like these are more “our” holiday traditions and less like something that everyone does. Oh my goodness, my favorite Christmas movie is Elf, no question. It’s Christmas-y, it’s unashamedly silly, and it has great music. Buddy the Elf’s unbridled enthusiasm about Christmas and Santa always wakes up the magic of Christmas for me. What’s not to love about The Best Christmas Pageant Ever by Barbara Robinson—a story in which a family of rough kids known as “The Horrible Herdmans” end up taking over the church Christmas pageant? My kids and I are charmed by the humor and heart of this beginner chapter book from the 1970s. It’s been a favorite bedtime read-aloud for us during December. One of our family favorite books at Christmastime was The Snowman by Raymond Briggs. It was a present my son received for his first Christmas, along with a snowman stuffed animal companion. When he was old enough, we would look at the pictures and he’d hold his own snowman friend. He still has that stuffed snowman, even though he’s now 18. The book, unfortunately, didn’t survive very long around his little sister who came along a few years later. She was more of a thrower than a reader. Little Women by Louisa May Alcott isn’t really a Christmas book, but a memorable wartime Christmas for the four March girls does feature prominently in the early part of the story. To me, that makes it a great Christmastime read. My older daughter and I have read the whole book together. Maybe I could get my younger daughter to sit through just the Christmas part this year if I let her make loom-band bracelets while I read.